Supposed to rise up to 255mts in height and 65 floors this luxurious product was supposed to have the studio, 2bhk, 3bhk and 4bhk apartments. Back in 2011 when this project was launched at 7000 PSF. and prices went up to Rs. 10000 PSF. many believed that this would be a scam and the developer won’t be able to complete the project. No doubt the journey has been slow for The North eye, and it's been delayed but this proposed tallest residential building (which isn’t the case now) is gaining ground. How long will construction take is a question we can't answer. At this pace, we believe it will take a lot of time for sure but if this product is delivered as promised it will create a stir in the market and become a landmark. 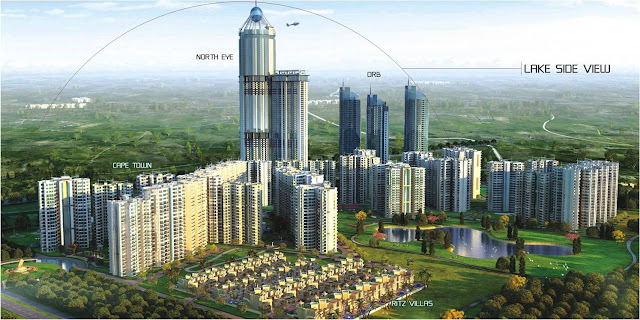 Delhi NCR region where all the action is taking place in terms of construction and is one of the most upcoming areas and is ideal for residential buildings. The whole building stands on 50 acres. 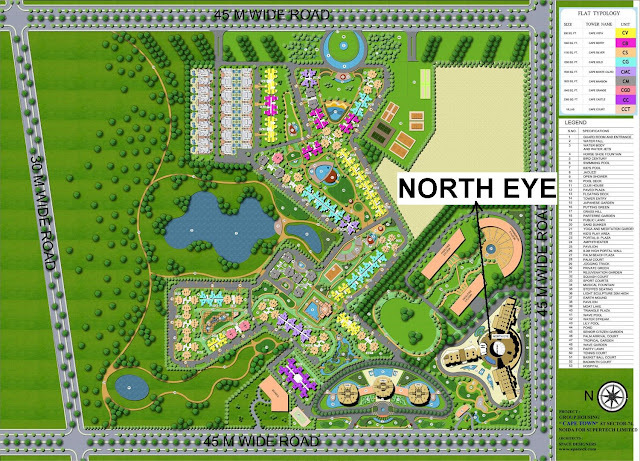 It is located in Sector 74, Noida. In terms of social infrastructure, it has few hospitals in the vicinity the major one’s being Fortis & Metro. Having said that distance from the city centre is an issue. The project is around 5.0 km Noida city centre metro station and 2.5km Sai mandir. You are dependent on your personal vehicle for travel. The entire area is about 50 acres. The project comes with a world-class fitness club a spa and yoga meditation centre. It also hosts an Indoor games zone an Infinity pool, an observatory with coffee lounge and art gallery & Open Air restaurant and the helipad on Top floor. Now that is the luxury! Coming to the layout the north eye is located well and will offer open views however the same can't be said about all the blocks. 70 % of the towers are well spaced and will have open views. 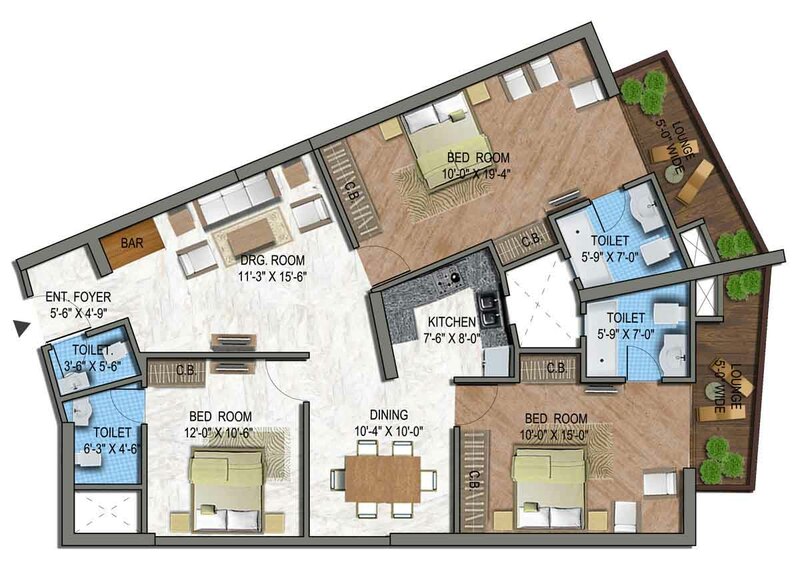 1BHK 535Sqft: Studio apartment is an advantage as few travellers who come on a business trip for few months can rent it. It is about 535 sqft. It has one bedroom, kitchen, dining hall, one washroom, and living room. Made for investors and people who want to show off we guess! 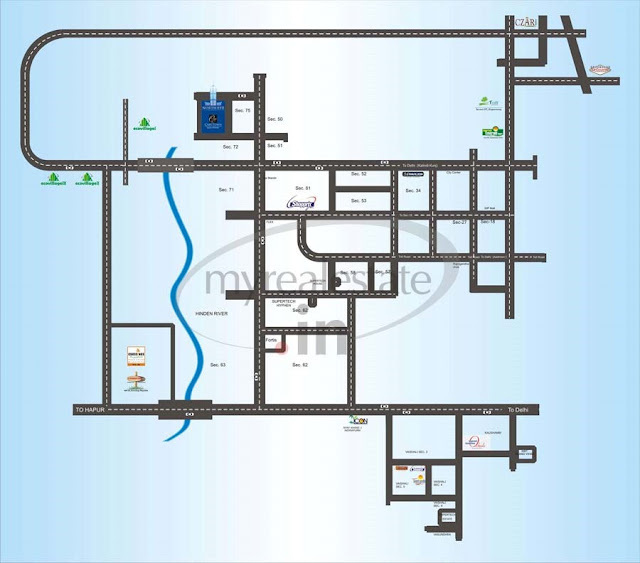 3BHK 2510Sqft: Again conical shaped, these 3BHK apartments are about 2510 sqft. and are more spacious than any other & the bedrooms come with attached bathrooms and a dresser. But there are multiple problems in the layout. Access to 2 of the bedrooms is via the kitchen which is open. The Living room is divided as formal and informal living room and you can't use the entire space to the maximum. The other errand is that the conical layout which makes the rooms oddly shaped' which will cause a problem when you design your furniture. 4BHK 3350Sqft: The 4BHK’s are approximately 3350 sqft and the apartment is spacious. The bedrooms are not square which makes placement of furniture a task. There is a sitting lounge next to the living room where the deck is placed. The kitchen is well ventilated and is an open kitchen that is connected with the dining area. The dressing room is provided in every bedroom. The apartments are loaded, they come with Italian stone flooring. The kitchen walls come with a mix of Italian and Spanish marble. The apartments are finished in cement plastic emulsion paint with POP punning and texture finish. One thing missing is the modular kitchen. Each apartment is nicely furnished in different and unique style, with a spacious living room combined with a kitchen that contains all basic amenities like microwave, washing machine, fridge etc. One reason why investors will be interested is that the famous F1 track few kilometres away. This is a luxury product but it's best if we wait till possession taking a final call since delivery will take time.